Richard Scott is rich, conservative, and hates universal healthcare. 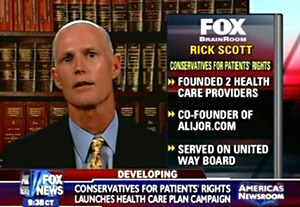 He’s all about “patients’ rights,” you see, and intends to spend a big chunk of his fortune making sure people know it. Once lauded for building Columbia/HCA into the largest health care company in the world, Mr. Scott was ousted by his own board of directors in 1997 amid the nation’s biggest health care fraud scandal. Ah, yes: competition and accountability. Let’s talk about that, shall we? Or, rather, let’s outsource it to our very own Blue Girl, who just happens to have worked at HCA back when they were bilking the taxpayers out of millions of dollars. If you want to know how they did it, she’s got the story right here. It was simple! And it’ll remind you of Enron, IndyMac, AIG, and all the other bright lights of competition and accountability in corporate America that we’ve come to know and hate. And for a real zeitgeist blast, there’s also this: Scott steadfastly maintains that he did nothing wrong, and for his current venture he’s hired the same PR firm that represented Swift Boat Veterans for Truth in 2004. Central casting could hardly do better. The wingers really know how to pick ’em, don’t they?